I absolutely adore radishes. They’re one of my favorite springtime treats here at Tumbleweed Farm. I prefer my radishes eaten straight up out of the field with a little dirt still on them. That crunch….it’s so damn good! 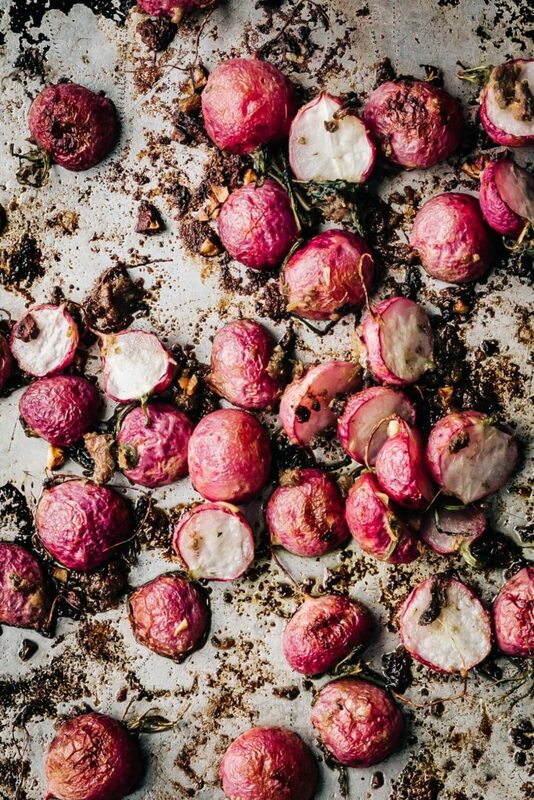 However, as we’re still experiencing really cold and wet weather I wanted to turn to my other favorite method of eating radishes–roasted until caramelized and tender. I was inspired to pair the radishes with salty anchovies because of how much I love the miso-glazed radishes out of my cookbook. Miso is salty and I felt like the anchovies would add a nice salty kick. When roasted the radishes and anchovies mellow out a bit and this quick side dish has turned into a new favorite at Tumbleweed Farm. I tested the recipe out on our newest employees and the verdict was this– “Hot damn! Can you make these everyday this spring?” I’d say this recipe is a win. It’s a great side dish to bring to a dinner party or simply served as a happy hour snack with a few cold beers. In a large bowl toss the radishes with the anchovy fillets, garlic, oil, salt and pepper. Place on a baking sheet and roast in the oven until the radishes are deeply browned and shriveled a bit. About 30-35 minutes. Toss halfway through cooking. Remove from the oven and drizzle with a tiny squeeze of fresh lemon juice.